Discussion in 'Latest US & World News' started by Horhey, Feb 12, 2019. The propaganda has now reached Contra war levels. 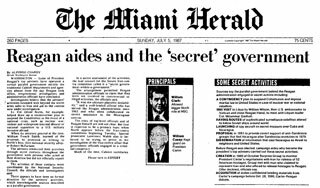 The Red Cross and the UN had warned the US against this PR stunt. Elliot Abrams has a history of using humanitarian aid as a vehicle for delivering aid to rightist paramilitaries. The bridge in question has also been closed since 2015. In addition, Mike Pompeo now claims that Hezbollah cells are in Venezuela.... If that frightens you then you are what's called a "low information voter." I do not have the time or the energy to explain the absurdity of this claim. Just know that Pompeo and the media do not respect your intelligence and that they are not your friend. I strongly question the US motives. Let the Venezuelans sort it out. If they want to rise up so be it, if they want to stick with Maduro no skin off my back. Do you have anything that actually proves he is letting the aid through? Nothing you quoted is actual evidence. Surely someone, somewhere has snapped a picture of aid being delivered. Perhaps the best solution would be to accelerate the collapse. And if we can do something that will bring that end quicker, we probably should do it, but we should do it understanding that it’s going to have an impact on millions and millions of people who are already having great difficulty finding enough to eat, getting themselves cured when they get sick, or finding clothes to put on their children before they go off to school. We don’t get to do this and pretend as though it has no impact there. We have to make the hard decision—the desired outcome justifies this fairly severe punishment. 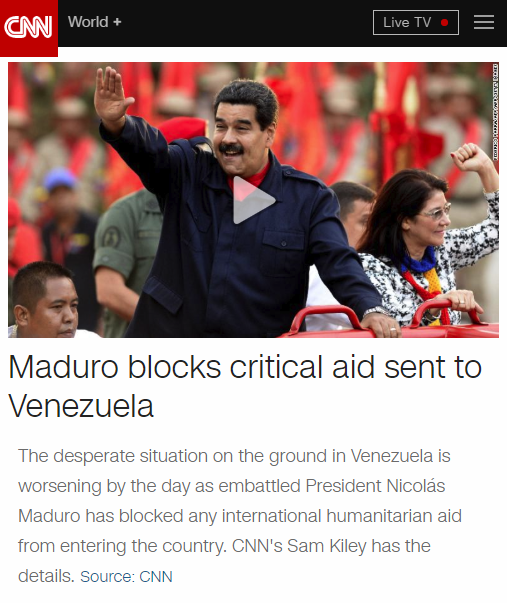 And in the last week, the Red Cross has doubled its budget for Venezuela, so whatever you think of Maduro, he certainly doesn't block aid *in general* just the current scheme tied to Washington's recognition of Guaidó. Your link says that the Red Cross is only helping Venezuelan migrants in neighbouring Colombia and Brazil. I guess Maduro isn't letting them in his country huh? Only US aid has been blocked. Neither the Red Cross or the UN have said anything about their assistance being rejected. From the article. GENEVA (Reuters) - The International Committee of the Red Cross has doubled its budget in Venezuela to 18 million Swiss francs in recent weeks and is also helping Venezuelan migrants in neighbouring Colombia and Brazil, ICRC President Peter Maurer said on Wednesday. helping Venezuelan migrants in neighbouring Colombia and Brazil, ICRC President Peter Maurer said on Wednesday. Do you have anything to say about the US punishing the Venezuelan population for voting the wrong way last year?